Car Safety Hammer - Why Do You Need One? Do you worry about getting trapped in your vehicle as a result of a an accident? A car hammer will give you peace of mind. Electric windows in cars do not work once their power source is cut. When trapped in any vehicle, to escape you need a window breaker to smash the glass and a seatbelt cutter to snap jammed seatbelts. Our car hammer aka lifehammer has a window breaker and a seatbelt cutter to enable quick escape. Few seconds can mean the difference between life and death. - Potential to save lives in a serious auto emergency. Loved ones and you can escape from an overturned, sinking or a burning car. - Seatbelt cutter with razor sharp blade recessed to protect fingers from accidental injury. - Pointed steel head (red protective plastic cover) easily shatters side windows. - Compact, lightweight, bright colors red & yellow - easy to see. - Sturdy yet doesn't take up a lot of space. Easy to store in the glove box or car's center console or side door. What are you getting? 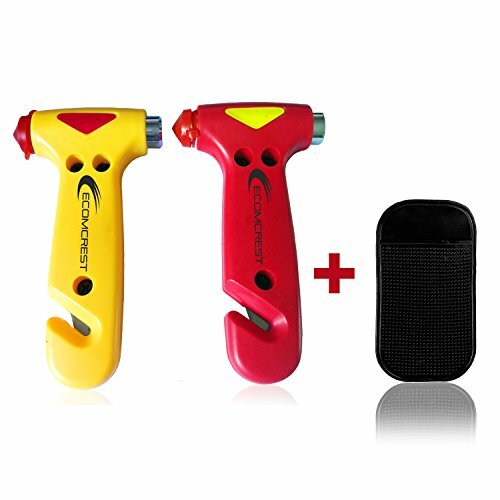 Pack of 2 Car safety hammer. One red and one yellow. Disclaimer:In some extreme cases it may not be possible to escape from your vehicle. It is difficult than one may imagined when reviewing this product. There is no guarantee that this tool will prevent serious injury or death. It depends on severity of the incident and actions/reactions of the person affected. Get Your Safety hammer Now For your Peace Of Mind... Click the "Add To Cart" Button At The Top Of This Page. Each Safety hammer Has a Seat Belt Cutter With Recessed Razor Blade - Easily Cut Through Seat Belts for Fast Escape. Comes with Sticky Car Dashboard Mat - Holds Cell Phones, Sunglasses, Coins, Golf Cart, Boating, Speakers. If you have any questions about this product by Ecomcrest, contact us by completing and submitting the form below. If you are looking for a specif part number, please include it with your message.